If you have been skiing since before you can remember, if you like your slopes challenging and extreme, if you catch the first lift in the morning and ski through lunch and meet your less capable friends for dinner – read no further. This story is not for you. Instead, this is a tale for all the unheralded fans of the great alpine sport who have been toiling away in ski schools and on beginner slopes while your friends have been wizzing around fabulous resorts telling you all about how great it was over dinner. Yes, you who have taken up a difficult sport at a late age. You, who no matter how cold, tired and frustrated you are, come back year after year for more. You deserve better and guess what? It doesn’t have to be painful or boring, uncomfortable or ungastronomic. You can ski in one of six Italian towns in the Alta Badia in the Dolomites: Corvara, Colfosco, San Cassiano, La Villa, Badia and La Val with the best being, in my view, Corvara. I have written about Corvara before – in 2008 2007 and 2006 – and if you need information about hotels, restaurants and transportation, check out these posts as not much has changed since then. That’s part of the charm of the place. The region still offers massive intermediate terrain – 460 lifts connecting 1,220 kilometers of pistes across three regions of Italy – with few lines, good food, good accommodations and good value. After all this time, we even figured out a better and cheaper way to get there which involved a flight into Verona, then a train to Bolzano and a taxi to Corvara. But what struck me this year was how perfect this resort is for a group of skiers of mixed ability, in particular for those skiers who often get left behind. In our group, we had everything from rank beginners, to gung-ho fanatics. There were skiers returning after twenty years, skiers returning after surgery, someone who first learned to ski in Morocco and mostly people who learned to ski as adults. In many ski resorts, most of the members of a group like ours would have been confined to a boring, small part of the mountain. But not in Corvara and the other towns of the Alta Badia. In this alpine arcadia, almost anywhere you would want to go can be accessed via a blue run. 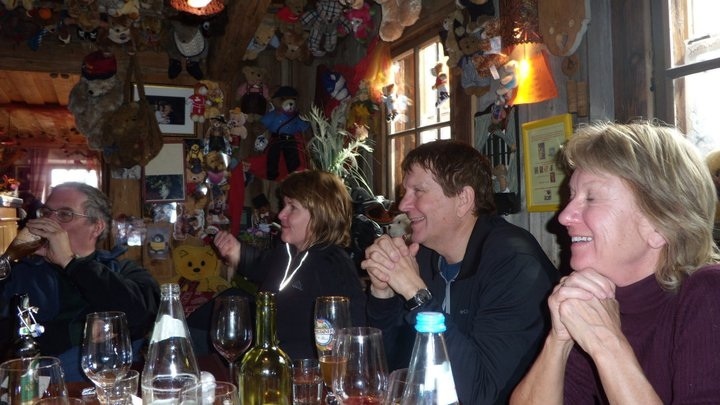 And I offer as evidence the expedition we made together to the Church of Santa Croce; a day-long ski tour that offers some of the best natural beauty and gastronomy in the Dolomites. Our group set off in the morning, happily making our way from hamlet to hamlet via lifts with views and along easy to moderate slopes until we eventually reached Pedraces and the lifts that took us up to the Church of Santa Croce and its fabulous panorama. After our visit to the sanctuary, we skied down to a man with a horse and old fashioned carriage who took us to a hut (Trattoria Oies 0039 471839671) filled with teddy bears, witches and the hardest partying Italians I have ever seen on a ski slope, where we had an amazing lunch of local specialties with lots of wine. After lunch, those who were tired took a taxi home, those who were not skied. And here’s my point. Everyone in our group, regardless of ability, had the chance to ski from village to village. Everyone could particpate in a real ski tour. No one was left behind or excluded. It was for all a perfect day. So the next time you go skiing with someone who says, “I’ll meet you for dinner” tell them “No way. We’re going to Corvara where, like Black Hawk Down, they leave no man behind.